Chiyoda Almana celebrated the completion of Summer Internship Program to university students by giving Certificate of Participation to 5 engineering students from Texas A & M University and Qatar University. 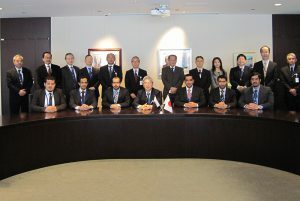 The Internship Program has continued successfully for the last 5 years, where Chiyoda Almana offers the opportunity to undergraduate engineering students in Qatar to join the company’s engineering department on a job training program to expose the students to the real work environment and to transfer the accumulated knowledge from company team to the young engineers. 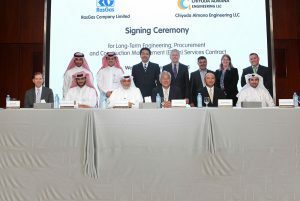 Chiyoda Almana as a reliable engineering services provider in Qatar applies great focus on building and reinforcing relationships with educational and academic institutions to deliver on its corporate social responsibility (CSR) activities and support Qatar sustainable development in line with Qatar national Vision 2030. The internship program comes as one of the continued programs introduced to undergraduates and graduate engineers to support their career development and enhance human resource capabilities in preparation for their involvement in the real business market. During his meeting with the students, Mr. Nagasaka, Managing Director of Chiyoda Almana assured to continue the effective role played by the company to support the development of engineering students in Qatar as part of the company commitment to CSR. The 5 undergraduate students expressed their appreciation for the offered opportunity and are looking forward to applying the learned concepts and skills to their work activities in future.